Guido Braschi has led New Horizons since 2015 and recently stepped down from that role. We spoke to him to find out more about this venture to partner with mission agencies and Christians in new places for OMF. What’s the story behind the launch of New Horizons in 2012? In the late 1990s and early 2000s several OMF workers went on exploratory trips to Africa and Latin America, and reported on growing indigenous mission movements in many of the countries they visited. At the same time we noticed a stagnation or even decline in the number of new workers from many traditional sending countries. Seeing the magnitude of the task ahead of us in East Asia, we realised that we had to find new ways of mobilising people and mobilising them from areas new to OMF. At the same time many newer mission agencies were coming to us, asking for help to develop best practices for missions. Jon Fuller, then International Director for Mobilisation, submitted a proposal for a new OMF unit to respond to this radical change in world Christianity and OMF New Horizons was born. In 1989, the year when the Iron Curtain fell, I watched in amazement as communist regimes across Eastern Europe fell, and wondered how God would work through these events to enlarge his kingdom. In the ensuing turmoil, churches re-emerged after having to keep a low profile for the previous seven decades. Mission was back on their agenda, and I was keen to explore how this would impact world mission, but particularly how OMF could share the spiritual needs of East Asia with them. However, God had different plans and redirected us back to Asia for seven years. Upon our return to the UK in 2007, the European OMF directors asked Linda and myself to connect with emerging mission agencies in Scandinavia, Eastern and Southern Europe and explore possibilities for partnerships with OMF. How has New Horizons developed since then? Initially, New Horizons was focused primarily on Latin America and Europe, but today we have contacts and partnerships with mission agencies in many parts of the world. And excitingly, new workers from Latin America, Africa and Asia have started to join us from countries which, until recently, were considered to be missionary-receiving rather than missionary-sending countries. As God has been changing the face of world missions we have had the joy and privilege of being involved in this global development of indigenous mission movements. What have been some highlights from your time leading New Horizons? Meeting with people around the world who were enthusiastic about world mission was a very beautiful and enriching experience. Journeying with candidates and seeing God provide for their needs has reminded us how great our God is. Now that many of these people have taken up their ministries in East Asia, seeing how God is using them has been a real joy too. Can you tell me about some of the challenges you’ve faced in that time? On several occasions I heard the story of young people who sensed that God was calling them to serve overseas, but their church leaders were unwilling to send and support them. Walking with young people in these situations and helping potential sending churches grow their vision for God’s kingdom beyond their immediate situation was challenging. And as I watched people from new sending countries struggle to integrate into OMF I felt we had a corporate challenge to review our organisational culture, which was still based on Western values. How do you see New Horizons developing in the future? I’d like to see us identifying, calling, training, and empowering local mobilisers around the world; godly people who have a burden for East Asia and are gifted communicators in their own country. Only then can we be fully effective in mobilisation and call ourselves a truly global organisation. How can we be praying for New Horizons? Pray for new personnel for New Horizons. We are currently looking for two individuals or couples to serve as mobilisers in Latin America: one for Mexico, Central America and Caribbean, and one for Spanish-speaking South America. We also have an arrangement with SIM to use their West Africa sending base in Ghana, and would like to have an individual or couple based there. Pray for the right partnerships in different parts of the world. Pray also for the ongoing finance for New Horizons; it will take another few years before it can be self-funding. Guido Braschi grew up bilingual with Italian and German but now speaks a further four languages. 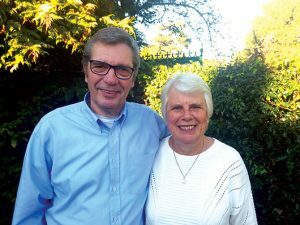 Together with his wife Linda he has served with OMF since 1982, working initially in student ministry in East Asia, and later as a team leader. From 2007 to 2012 Guido served in many roles with OMF UK, including a spell as Acting National Director. Since 2012 he has served in various positions in New Horizons.